This is a current ongoing project. 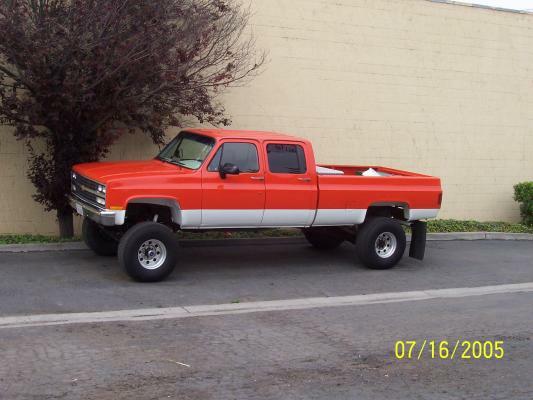 This 1973 crewcab started life as a rolling shell. Full frame off rebuild. The frame was blasted and painted in black imron. 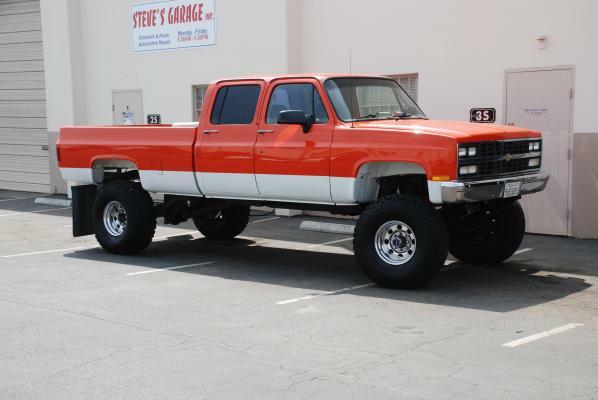 It has skyjacker 8" springs and Bilstein shocks at each corner. The front end is a Dana 60 outfitted with 4.56s and a power lock diff. The steering is from Off Road Unlimited and features crossover steering with the ram assist. The rear is a 14 bolt with 4.56s and a Detroit locker. Four wheel disc brakes and hydro-boost slows it right down. It rolls on CenterLine 16.5 x 9.75 wheels with 39 X 15.5 X 16.5 Mickey Thompson Baja's. The engine is a blown injected 509. Started out with a gen VI 502 block, factory steel crank, Eagle h-beam rods, connected to JE pistons. Assembled with Speed-Pro rings and Federal Mogul bearings. A custom Comp Cams hydraulic roller with Crane lifter is spun by a factory timing set. The cylinder heads are Edelbrock oval ports ported and assembled by McKenzie Cylinder Heads. Comp roller rockers and push rods finish off the valve train. Induction consists of a oval port Edelbrock Victor manifold converted to injection. A custom elbow mounts a Accufab 75mm throttle body. 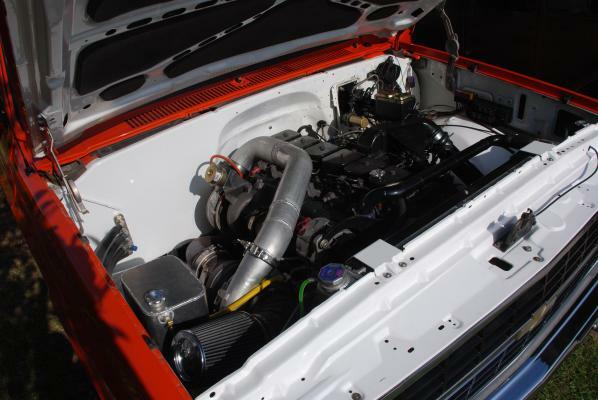 A Vortech J-Trim supercharger pumps out 9psi of boost to keep things interesting. Ignition is all MSD. The injection is handled by a F.A.S.T. sequential controller. Cooling is handled by a Griffin radiator outfitted with twin Spal fans. The transmission is the ultra stout 4l80-e controlled by a T.C.I. controller mated up to a NP205 transfer case. The body has been all updated with new GM sheet metal. The interior has been upgraded with later model bucket seats with the matching center console. The dash has been outfitted with Autometer Phantom gauges and a Clarion stereo. The whole cab has been Accumatted for noise control. Future upgrades call for new exhaust system to be built including 2-1/8 headers to let it breathe a little more and little bit higher stall in the converter. This was the hot rod I chose to build. More than a little excessive in power and size but a whole lotta fun to drive. And driven it gets, just about to roll 40,000 miles on it. UPDATE: We changed directions on this project as most do. Although the gas motor ran well it just wasn't practical in the application.. Therefore the smart thing to do was go diesel power. 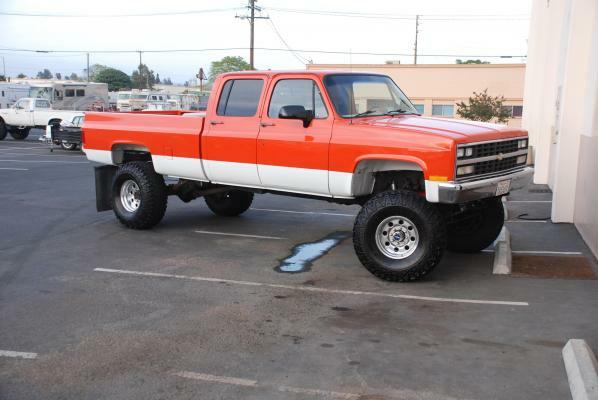 We got a used 96 12-valve with 180,000 on the clock. The fit is actually very nice. 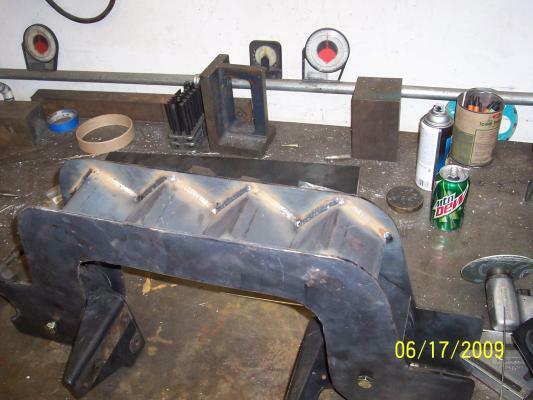 We custom fabricated a crossmember to mount the Cummins. The engine sits on the stock Dodge mounts. We used a De-stroked adapter and flywheel to mate it to the existing 4-l80e. When this started out it was supposed to stay mild. That didn't last very long. 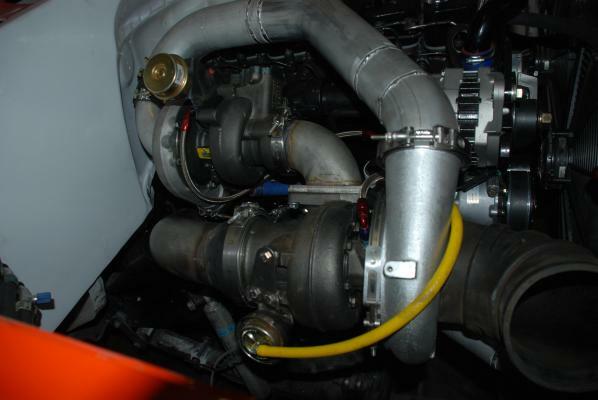 Industrial Injection turbo's were used on custom turbo setup. 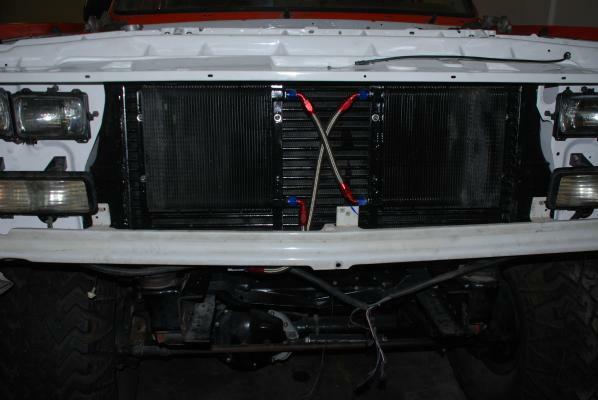 The intercooler is from the same truck the engine is. During the rebuild, we upgraded to a Vintage-Air a/c unit, new dash insert with a built in nav. and back-up camera. To drive this setup is a blast. This truck has been daily driven for years. 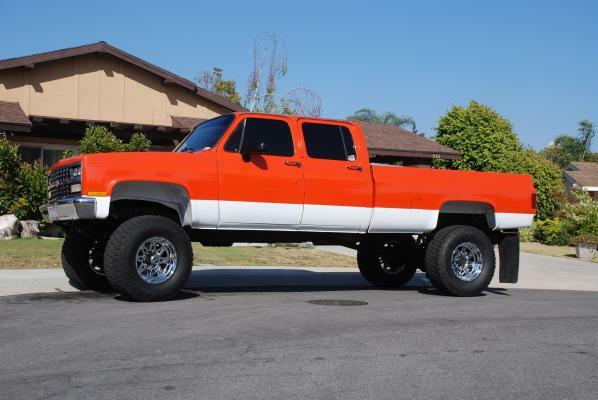 The diesel conversion is the best thing I ever did to this truck. 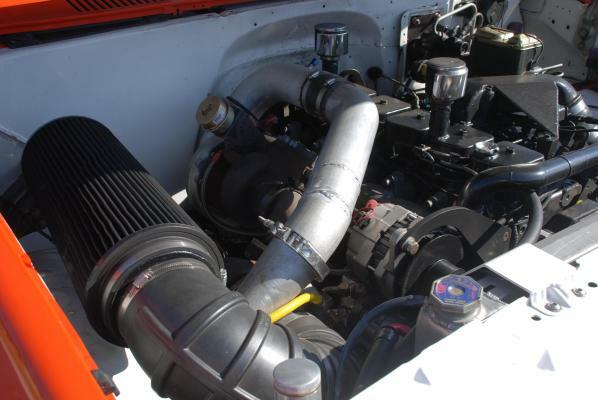 The Cummins has more power than you could ever need. It runs cool. It gets double the mileage of the gas setup. The Vintage-air works so good you have to turn it down. The only flaw so far is the converter is WAY too loose. UPDATE: Finally got all the pieces for doing the Allison 5-speed swap. And finally got time to get it installed. Works pretty good so far. Used the De-stroked adapter and computer. Made a custom adapter to mate the Np205 transfer case on the back. Used another Precision triple disc converter. Dropped the cruise rpm by about 150 rpm over the 4l80e.